We had cruised Celebrity three times before on a Transatlantic cruise and two voyages to the Caribbean. All had been highly enjoyable experiences. When we decided to visit Alaska for 33 days this year, it was an easy choice to book their ship, Millennium, for a week long cruise before discovering the state on our own. Choosing this line proved to be a wise choice. ​Built in France, the Millennium made its debut in 2000 and was the first-in-class flagship for Celebrity. She is a 91,000 ton ship with an occupancy of 2138 and crew of 997. The ship is 965 feet long with a beam of 105 feet. Her top speed is 24 knots. Since 2012, the Millennium has been refurbished twice. In May 2012, she added many Solstice Class features such as AquaClass staterooms and the restaurant, Blu, a restaurant free for those who stay in AquaClass cabins. The ship had a grand makeover in 2016 including redoing the Penthouse and Royal Suites. The new Rooftop Terrace, a venue where you can order snacks and cocktails, makes it possible to see outdoor movies. Another improvement is the Tuscan Grill, a specialty Italian steakhouse. We found passengers were international. While the largest contingency was from the United States, Australia, New Zealand, and Canada were well represented. There were also many from China, India, and Europe. Most were in the 45 to 65-age group. We were surprised we didn’t see many children. Perhaps, that was because our cruise started on May 27. Attire is primarily casual. Evening “chic” has replaced the two formal nights. That means men can wear a sport coat or collared shirt. No suit or tuxedo required. Women can wear cocktail dresses, sundresses, designer jeans or nice pants. This is a great idea, particularly if you are spending additional time in Alaska, as it leaves packing space for more casual clothes. 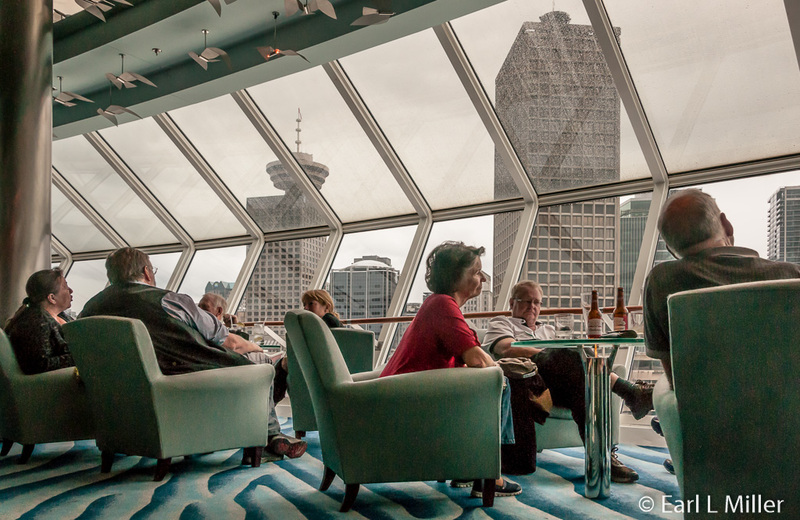 The Millennium departs from Vancouver, Canada or Seward, Alaska for week long cruises. Her itinerary is destination oriented with only two days at sea. She visits Ketchikan, Ice Strait Point, Juneau, Skagway, and Hubbard Glacier. During the winter, the ship is in Asia. 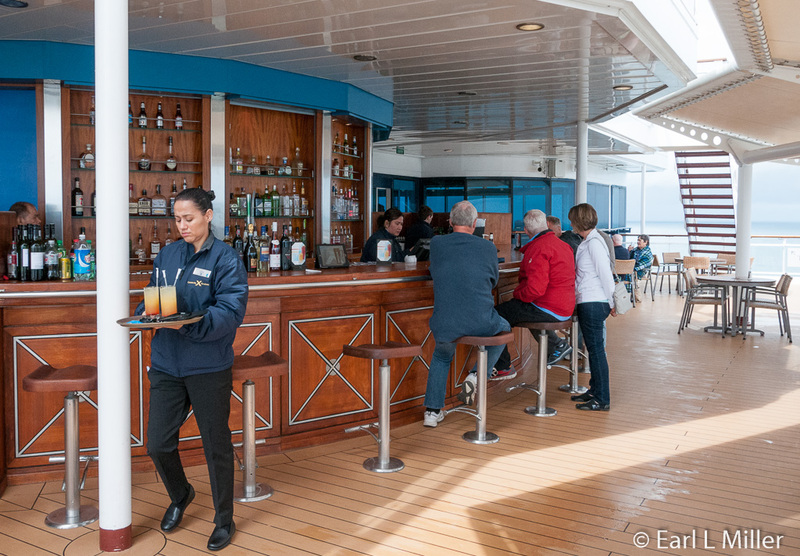 Our embarkation was one of the smoothest and fastest that we had experienced in more than 30 cruises. We arrived by shuttle from the airport and were at lunch within a half hour. While there was some walking to go from station to station, friendly employees handled it very efficiently, making this part of our journey very easy. We had purchased a Concierge Cabin which provided for expedited embarkation and disembarkation as two of the room’s privileges. But I did not see long lines anywhere. Kudos to Celebrity are due on this one. Our room was not ready until 1:30. The line held a special welcome luncheon in the dining room for those who booked this class. I had never seen that offered before on any cruise. Among the entrees were a rack of lamb and Pacific salmon. After lunch, we were immediately able to get into our room. Our luggage arrived before we attended the mandatory lifeboat drill at 4:00. Celebrity holds their drill in rooms such as the Rendez-vous Lounge. You check in as you enter the room, and it’s not mandatory to bring life jackets. Disembarkation was easy. Our color for our departure time was called before it was scheduled. At the port, we easily spotted our luggage. We didn’t go through customs or immigration since we had done that in Vancouver. In less than a half hour, we were on our way from the time we were called. Of Millennium’s 1,079 cabins, 867 are ocean view with 623 of those having balconies. The ship also offers 50 suites in various sizes and amenities and 26 accommodations that are fully ADA compliant and wheelchair accessible. Standard inside and outside cabins are small at 170 square feet. Balconies add 38 square feet of outdoor space. Our Concierge Class room measured 194 square feet and had a 54-square foot balcony. We found pastel tones, light wood furnishings, and bathrooms with adequate space for medications and toiletries. The shower stall was small. We had a small sofa and two very comfortable twin beds. The desk had a refrigerator underneath it and cupboards on both of its ends. There were minimal drawers - only in the night stands. Four small shelves hung next to the closet. The desk area included a chair. The veranda housed two chairs and a table. For those just taking a week long cruise, storage is adequate. For extended visits to Alaska, people can do what we did which was to keep most of our clothes in our suitcases. Celebrity would be smart to build some shelves into part of the closet. 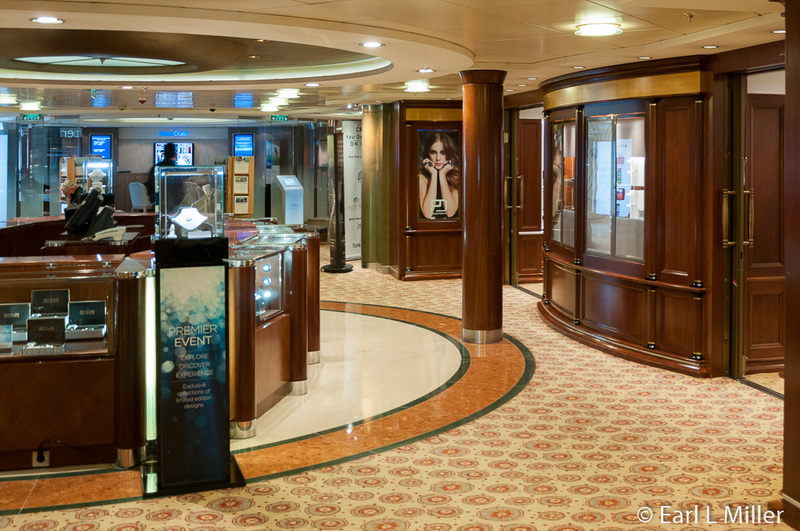 It came with amenities that you only find on Princess Cruises if you pay for a full suite. These include a pillow menu, daily fresh fruit, a bottle of wine on embarkation day, nightly hors d’oeuvres, use of binoculars and umbrella, and robes. We also found a handheld hair dryer, received a Celebrity Cruise tote bag, and could order from an expanded room service breakfast menu. Services include the use of a concierge and priority disembarkation with the use of a pre departure lounge. Our room steward, Joardan, from the Phillippines, was superb and saw promptly to our requests. His service was almost magical as the room was made up promptly daily. Turn down service at night, with the chocolate on the pillow, and the next day’s issue of “Celebrity Today” was there immediately after dinner. Some stewards made animals out of towels. Joardan did not. The remote for our TV didn’t work but was quickly replaced. AquaClass Cabins are the same size as Concierge Cabins but come with different perks. In-room amenities include daily tea delivery, an upgraded room service menu, pillow menu, toiletries such as shower gel and lip balm, and a Hansgrohe shower head. They also have the use of provided bathrobes. In addition, they receive spa privileges such as access to free dining in the Blu Restaurant, complimentary passes to the Persian Garden steam and sauna room, and on-demand wellness programs. The Blu restaurant, a spa-dining venue, is also free for those staying in suites, space permitting. It’s open for breakfast 7:30 to 9:00 a.m. serving meals like smoothies and muesli. Dinner from 6:00 to 9:30 p.m. ranges from roasted chicken breast to blackened ahi tuna. A five-dollar gratuity is recommended. In an interview with Hotel Manager Bosco Pires, he advised the Concierge and AquaClass rooms sell out very quickly. If you want one of these, it’s best to reserve them way in advance. The ship features four types of suites. The 26 Sky Suites are 251 square feet with a 57-square- foot balcony. They offer no separation between living and sleeping areas. The eight Celebrity Suites come in at 467 square feet with 85-square-foot balconies and a whirlpool bath. These have separate areas. The eight Royal Suites are 538 square feet with a 195-square-foot balcony including a whirlpool and lounge furniture. The two Penthouse Suites are 1,432 square feet with a 1,098-square-foot balcony. They’re equipped with such items as a baby grand piano, butler’s pantry, motorized drapes, entertainment centers, and a master bath with a whirlpool tub. Suite amenities include butler service. 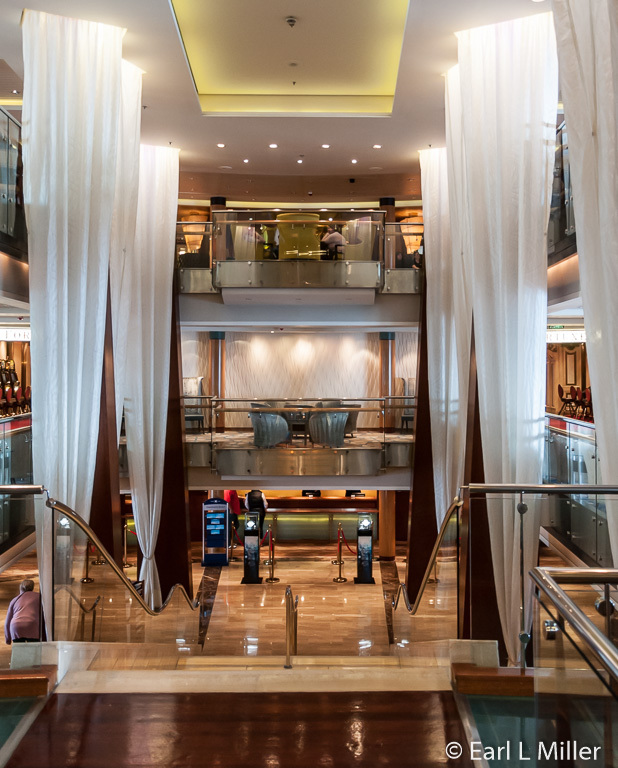 Priority services include check-in and debarkation, tenders, and restaurant and theater seating. They also receive afternoon canapes and tea service daily and one or two specialty restaurant meals. The suites have their own restaurant - Luminae. All cabins have interactive televisions which allow you to check your bill or order room service and excursions. This makes it easy and possible to avoid long lines. Programming includes Fox, CNN, ESPN, several movie channels, and several in-house channels. All also have hair dryers, fridges stocked with items that aren’t free, safes, and telephones. From the line's inception with well known chef Michael Roux, Celebrity has always been known for superb food and menus. It ranges from French inspired cuisine to simple food such as grilled fish. The food and service in the two story main dining room, the Metropolitan, was outstanding. Its decor is laid-back, not the least glitzy. Although it’s a large space, it’s easy to carry on conversations. Seating consists of two options. Traditional dinner times are set at 6:00 and 8:30 p.m. We chose the more flexible Celebrity Select dining option. That meant we could have dinner any time between 5:30 p.m. and 9:30 p.m. We could sit alone or at a table with other passengers. On our second night, we found a table for two at the restaurant’s entrance. Our waitress, Maritza, from the Ukraine, was wonderful - efficient and fast. We immediately scheduled this same table for 7:30 for all but the one evening when we ate at Tuscan. A daily alternative menu includes escargot and shrimp cocktails for appetizers; roast chicken, salmon or New York steak; apple pie and cheesecake. Those are always available if you don’t find something you want on the regular menu. That was never a problem. My conflict was finding too many dishes I liked. I learned from Bosco that the ship has set seven and fourteen day dinner menus depending on the cruise’s length. It is adapted for holidays such as Thanksgiving and Christmas. You can also have breakfast in the Metropolitan. 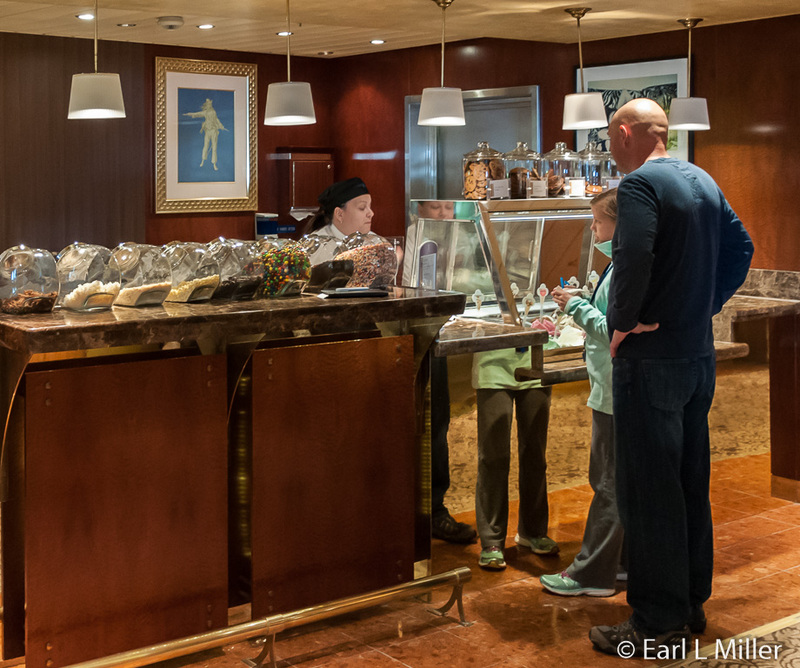 On port days, for those with early excursions, Celebrity offers their popular Express Breakfast. It consists of eggs, bacon or sausage, hash browns, and toast starting from 6:30 in the morning. Service is open seating and very quick. This was novel. On all other cruise lines, we had to head for the buffet or order room service. I was disappointed that lunch is not offered in the Metropolitan during port days. There are options available. Most people head for the Oceanview Café, the pool Deck buffet, open 24 hours a day for coffee, tea, and juice and from 6:30 a.m. to 1:00 a.m. for meals and snacks. The problem is the room does not enough provide enough seating at lunch to accommodate those returning from excursions or staying on board. 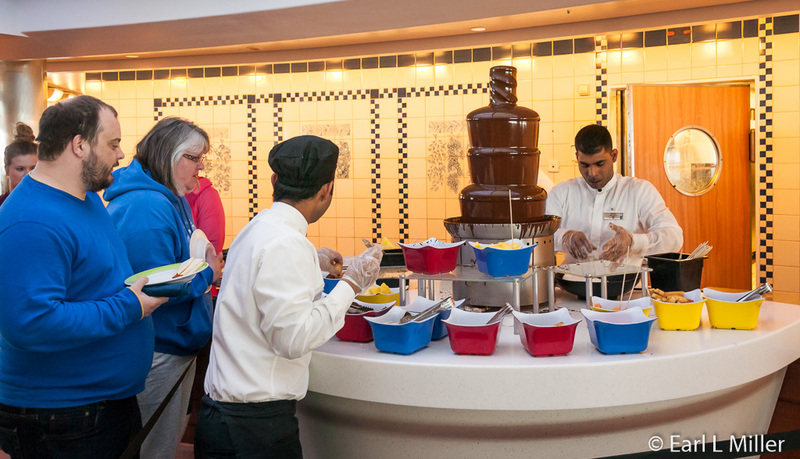 For breakfast, the buffet has an eggs and omelet station as well as typical waffles, pancakes, pastries, and cereal. Lunches consist of several stations - pizza, a salad bar, Ethnic themed such as Asian and French, hot entrees, and desserts. It’s the place to find ice cream in numerous flavors(served from noon to 9:30 p.m.) and delicious cookies. 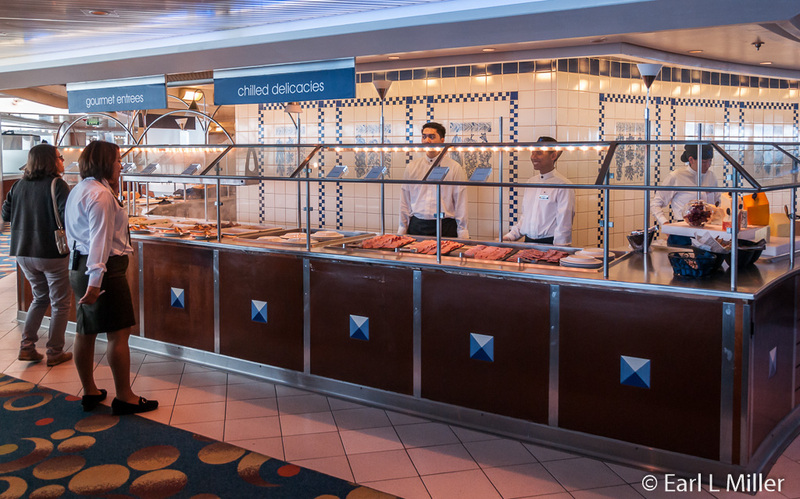 Passengers can also go to the Oceanview Grill serving hamburgers, hot dogs, turkey burgers, and veggie burgers, grilled to order. It’s open from 11:30 a.m. to 6:00 p.m. The AquaSpa Café, on Deck 10 across from the Solarium, serves healthy buffet-style breakfasts and lunches by the thalassotherapy pool. It’s open from 7:30 to 10:00 a.m. and noon to 2:30 p.m.
Another choice is the Café al Bacio, a combination coffee house and gelateria. It serves Lavazza coffee and Tea Forte for a fee. However, snacks such as morning croissants to light sandwiches, truffles, and mini desserts are free. Gelato is available for $3 for a small cup and $5 for a large cup. It’s open from 11:00 a.m. to 11:00 p.m. or midnight. We had dinner one night at Tuscan Grille, their Italian steakhouse, specializing in pasta, seafood, and aged steaks. It costs $45 per person. Although the food and service were very good, I thought the price was exorbitant. Without our ship credits, we would have eaten only in the Metropolitan since the food there was superb. Qsine is another specialty restaurant with a $45 fee per person. Sometimes on sea days, you can have lunch for $20. Its focus is gourmet food meant to be shared. The menu, presented on an iPad, includes such dishes as Kobe beef sliders, lobster fritters, and poached tiger shrimp. For dessert, you’ll find such items as cheesecake bites and beignets. Hours are 6:00 to 10:00 p.m.
Reservations are required at Tuscan Grille and Qsine. 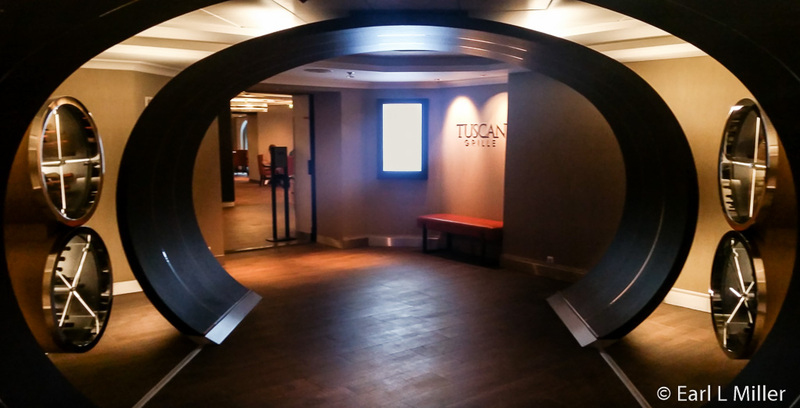 The Millennium offers three packages combining Qsine, Tuscan Grille, and Sushi on Five. Pricing for three dinners is $89 or five at $139 per person. The ultimate package consists of unlimited dinners plus one lunch at Tuscan Grille and unlimited lunches at Sushi on Five for $29 per day, per person. The casual Bistro on Five has a $10 per person service charge. Its main fare is crepes, panini sandwiches, soups, and salads. It’s open from 6:00 a.m. until late. No reservations required. At the popular Sushi on Five, on the fifth floor, you’ll find individually priced Japanese food. Room service is available 24/7. Some foods, such as a fillet steak for $20 or crab cakes for $11, have a price while most foods do not. Passengers can order selections from the menu during dinner or hang a card on the door for breakfast. Between 11:00 p.m. and 6:00 a.m., there’s a $3.95 service charge for passengers in interior, ocean view, and balcony staterooms. Tipping at other times is customary. Bosco told me, if passengers have a special request for food just let the restaurant staff know a little in advance. “Our staff will never say no,” he said. The ship has a large number of public rooms. The Grand Foyer rises from Decks three to five. 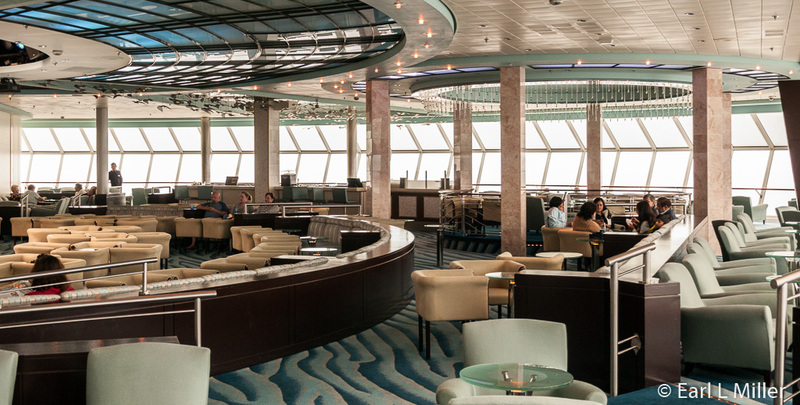 You’ll find guest relations, excursions, concierge, and a conference room on the third Deck. A photo gallery is on Deck four. 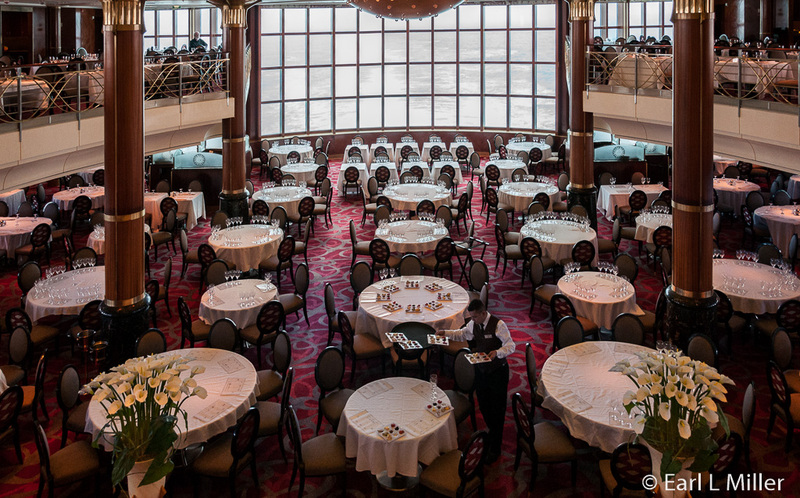 You’ll find photographers snapping photos as you embark the ship, on formal nights, and as you disembark at the ports. They sell a video of your trip. 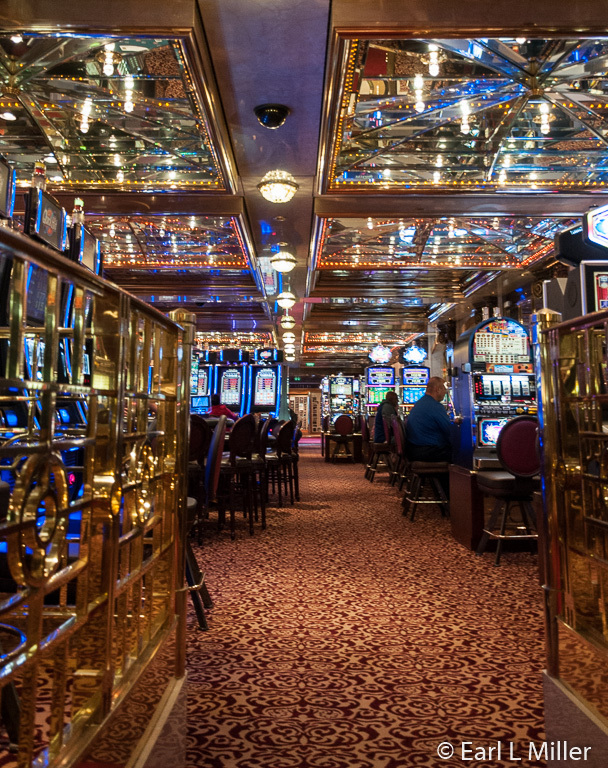 Cosmos, on Deck 11, is surrounded on three sides by floor-to-ceiling windows making it wonderful to watch the scenery. During the day, it’s used for observation and some activities. It is an entertainment venue at night. Fortune Casino provides table games as well as lots of slot machines. You pass through it between Rendez-Vous and the theater. Celebrity iLounge is a 24-hour internet cafe/computer room. It holds computer classes, mainly Apple, for a fee. Computer packages range from 75 cents a minute to 1,666 minutes for $400. It’s possible to get free Internet as a perk on some booking packages or by having a Royal suite. Wireless Internet is available shipwide. The Emporium shopping alley has a variety of shops selling duty free goods ranging from alcohol and tobacco, men’s and women’s clothing, jewelry, and logo items. It’s also the home of the future cruises department and Innovation Apple, an authorized Apple store. 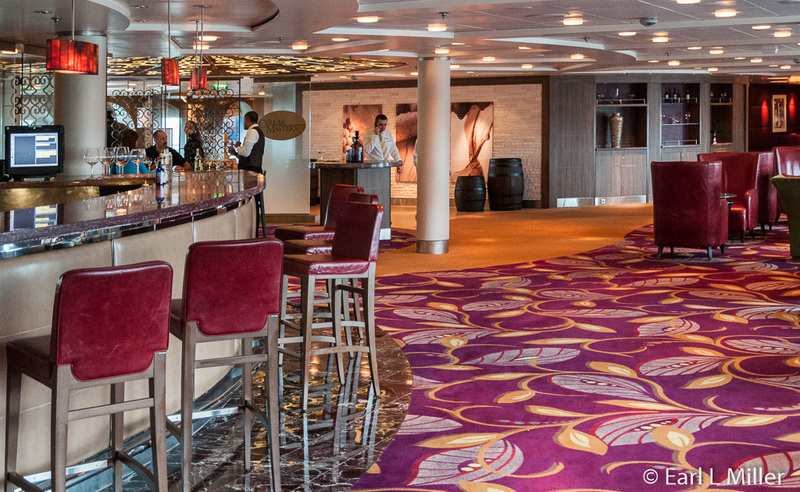 Besides Rendez-vous and Café al Bacio, there are seven other bars on the ship. Cellar Master is a 24-hour wine bar. The Martini Bar and Crush is a very popular pre-dinner cocktail spot. Sometimes you'll find live entertainment near here. Michael’s Club has flat-screen televisions showing sports. It’s stocked with more than 60 international and craft beers as well as premium Scotch and whiskey. Celebrity sells eight beverage packages ranging from a soda package for $9 a day to their premium package costing $65 a day which includes cocktails up to $13. The Classic Package, which you can purchase for $55 a day, is sometimes included as a perk when you book your cruise. It covers cocktails and spirits priced to $8. You have to pay the total cost plus 18% gratuity if it’s above that price. You can upgrade from classic to premium for $10 a day. The Fun Factory is for children while X-Club is the place for teens. A two-story library is on Deck 9. The ship has no-self service laundries on board. 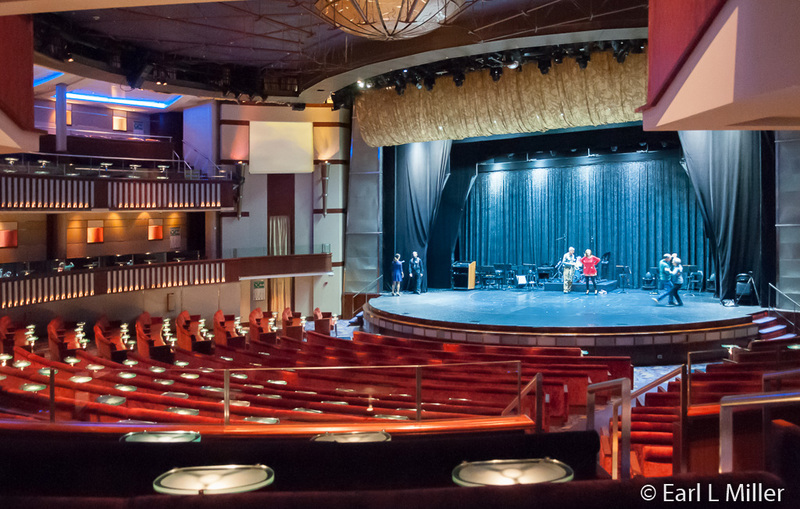 The Celebrity theater at the bow of the ship is on Decks 3, 4, and 5. It features comfortable banquette seating, a double balcony, and excellent unobstructed views. It actually looks like a theater. During the day, it’s used for classes, movies, games, and bingo, At night, it the main home for entertainment. Shows, lasting 50 minutes to an hour, occur at 7:00 and 9:00 p.m. In our week on board, we saw three high quality production shows. Only one had a change of scenery but all had numerous costume changes by the four singers and 11 dancers (4 male and 7 female). The six piece show band was excellent. The production, Simply Ballroom, on the second night featured all types of dancing from the tango to waltzes and jitterbug. On the fourth night, the show was Boogie Wonderland. It was a high energy show with music from the 70's. It included a script and told the story of how a disc jockey became a rock star. 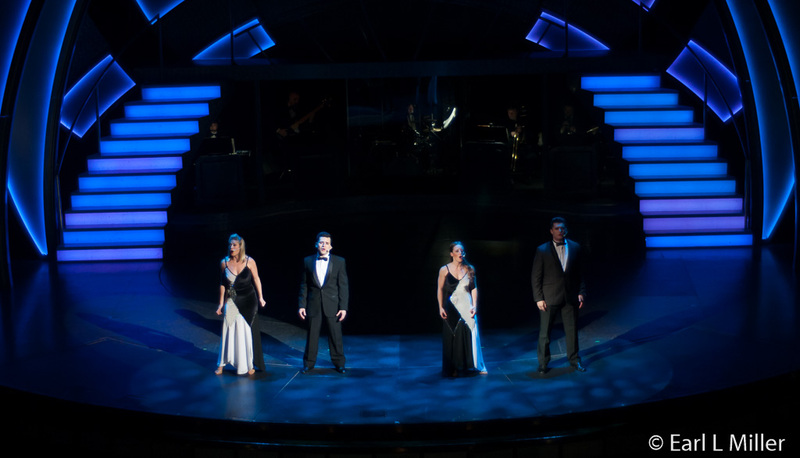 The production show, IBroadway, was the entertainment on the fifth night. I thought it was the weakest of the shows as recognized very few songs. Exceptions were one from South Pacific, one from Cats, and a few from Phantom of the Opera. On the first night, they had a comedian, Dan Greuter. He was proceeded by Milos Radakovich, a naturalist, who showed a slide show on the ports. Afterwards, we visited the Rendez-Vous Room, located across from the Metropolitan, to hear Soundtrack, a four-piece dance band. The evening show on the third night filled the theater. It was the singing group, Modern Gentlemen, four very talented performers who back up Frankie Valli, formerly of the Four Seasons, on his tours. They did Sinatra, the Beatles, Beach Boys, Four Seasons, and Motown. The crowd couldn’t get enough of them, and they were called back for an encore. Jesse Hawkins, an excellent R&B performer, did a 50 minute show on the fifth night. He reminded me of Nat King Cole. His show consisted of songs performed by Lionel Ritchie and Tom Jones, a lot of disco, as well as one from Lion King. Hawkins interacted a lot with the audience. The band was terrific, particularly the horn section. The final night’s show was a 15 minute production by the dancers and singers featuring 1960's music. Hawkins did a 20 minute show which was followed by a half hour two person (male, female) acrobatic team. I found the acrobatics boring after 10 minutes though Earl enjoyed them. After the shows, the ship held a variety of parties in the Cosmos Lounge. Sometimes Latitude played while on other nights disc jockey, RoXtar led festivities. These were proceeded by game shows or trivia in the same room. We didn’t attend since we had scheduled our excursions for early in the morning. The ship used to have a piano bar at Michaels Club. I remember one at the Martini Bar when we took a Transatlantic cruise on this ship in 2010. It was disappointing that no pianist now exists. It’s important to remember that Alaska is a destination oriented cruise. Similar to all cruise lines, the number and variety of activities on port days declines since fewer people are on board. What the Millennium does is provide a busy schedule on the day it departs from its home port, after it leaves the various towns, and on its two sea days. You will find activities range from art auctions, those showcasing the spa and stores, trivia, dance classes, cooking demonstrations, wine appreciation, and various sports events. Unfortunately, with only two sea days, a lot is crammed into those two days resulting in conflicts where you would like to be two people at the same time. For example, during the second day, the Executive chefs led a tour of Sushi on Five and the galley. A Taste of Millennium showcasing the specialty restaurants immediately followed.. Unfortunately, we missed it as we attended the destination highlights presentation and Milos Radokovich’s talk on Alaskan wildlife. Milos gave other slide show talks during the cruise ranging from astronomy to general science. His presentations were clever and informative. When the ship was at Hubbard Glacier on day six, he provided the narrative. He also led whale watching observations from the Cosmos Room. I was pleased to see lectures on excursions, port shopping, and on the various destinations were given by different individuals. Concierge cabin passengers even had their own excursions talk. Alaska is too cold and damp to explore the pool area, and passengers don’t. We did see someone in the hot tub. 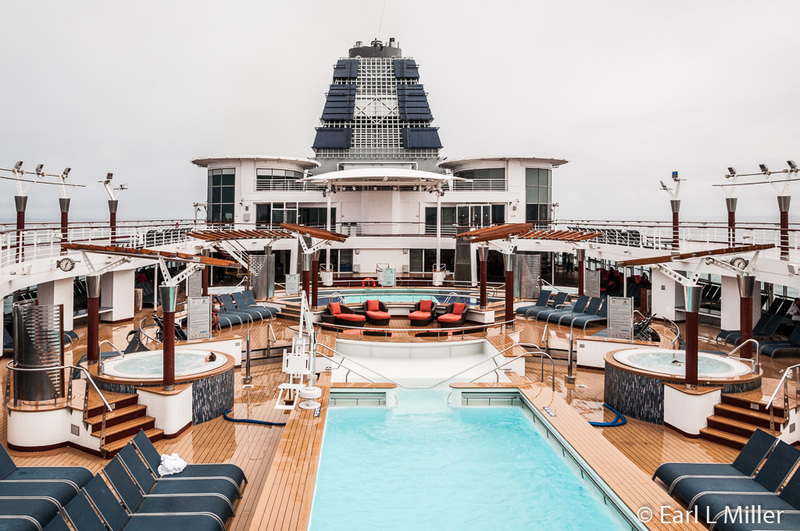 The main pool area, on Deck 10 midship, has lots of lounge chairs. It has shallow and deep ends. The area also contains four hot tubs, a bar, and table tennis. The Solarium has a no fee thalassotherapy pool under a retractable cover with teak lounge chairs. It leads into the Canyon Ranch SpaClub which includes the Persian Garden steam and sauna area, hair salon, and gymnasium. The cost to the Garden is $20 a day for those not staying in AquaClass cabins. The spa offers the usual treatments such as facials, skin care, scrubs, and massages. Licensed doctors offer acupuncture and Botox. The fitness area provides the usual cardio machines and weights. The ship holds daily fitness classes. Morning stretch classes are free while there is a $12 per person plus 15% gratuity charge for yoga and pilates. I contacted Nicole Diaz, who handles public relations for Celebrity, two months before we left home to set up interviews. I was impressed with her complete cooperation which enabled me to speak to the hotel director, Bosco Pires, and destination concierge, Joey Generoso. On this ship, officers and staff mingle with the passengers. On the second night, the captain and officers greeted passengers. Bosco was on the docks whenever excursions left in the morning. The restaurant operations manager, Mazy Rodrigures, consistently observed the activity in his restaurant. 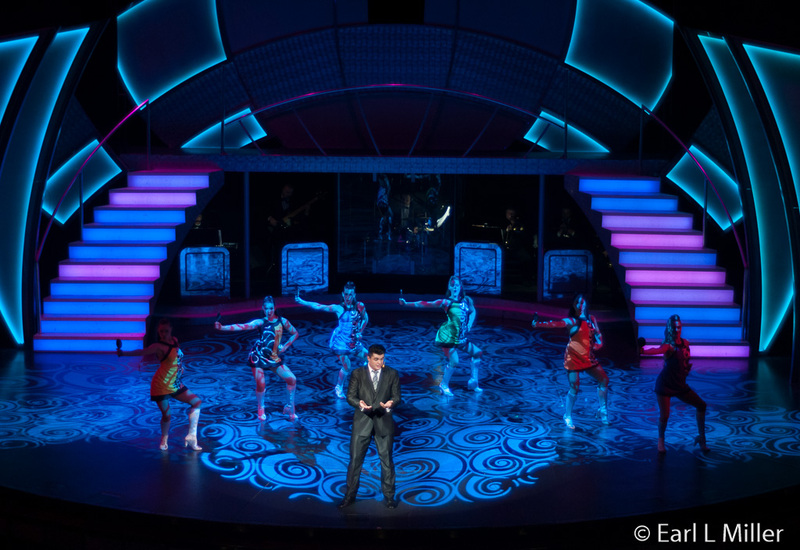 The cruise director, Steve Gayda, and entertainers, greeted guests at each show’s end. 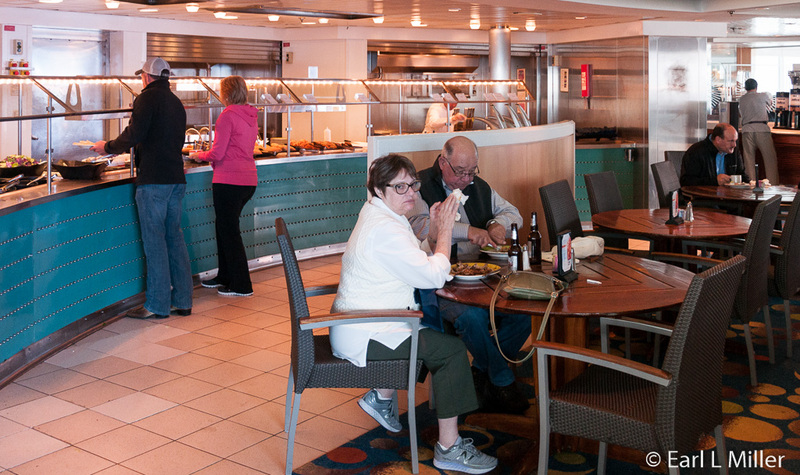 A happy crew on a cruise ship means happy passengers. Millennium’s staff was terrific - friendly, efficient, competent. Talking with some of the crew, I learned their contentment comes from having officers who are involved, care, and keep an eye on things. Knowing this is how Celebrity operates, I look forward to being on board again.